The TIM (Terminal Interface Monitor) was a MOS Technology Inc's build-it-yourself 6502 development system that was launched before the KIM-1. When a computer fan ordered a TIM from MOS Technology in Norristown, Pennsylvania, he got a MCS6530-004 (1k TIM monitor program in ROM), and a manual (15 sheets of 11x17 folded & stapled in the middle) containing a suggested schematic, the TIM monitor commands, and listing. He had to provide himself with various components, including the MOS MSC6502 processor. When the KIM-1 was announced in 1975, my order was immediately placed. The price was US$150. I received a KIM-1 with serial number 285. The 6502 at that time did NOT have the ROR instruction. About a year later, seeking more flexibility and wanting to use the newly added 'ROR' instruction, I purchased a TIM,an MCS6502 with the 'ROR' instruction, and two MCS6532's. I constructed a simple computer, much like the one in the TIM manual, on a kludge board. No box, it was powered by a lab supply. 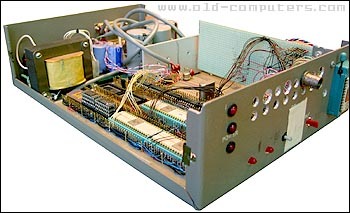 Features and circuits were added, and removed as required. Mounting it in the brown box with power supply was done in 1979, oneof the last modifications. It was then a small development system including a 2708 PROM burner (ZIF socket outside box), and a three position switch selecting the memory map presented after reset. I gave my KIM-1 to a friend in Teheran when we left Iran in September 1978. I kept the TIM which was just a circuit board at the time. We left Iran by taking a train to Moscow, then another to Belgium. When leaving the USSR, the customs officer looked at the board, and called a specialist, who quickly identified every chip and indicated that there was no problem. Long after it had ceased to be a development system, the TIM served as a printer switch, allowing three computers to share a printer, and using A 2708 EPROM containing the printer switch application code in the ZIF socket. see more MOS Technology TIM Ebay auctions !